Royal Ascot, Fred Astaire, riding to hounds, Cabaret, impressarios, John Singer Sargent’s incomparable portrait of Lord Ribbesdale, Willy Wonka, opening night at the opera, Alice’s mad teaparty – countless things whimsical and romantic have a common icon. One happy day I was given the task of choosing a name for my first field hunter, a compact, glossy black gentleman of a horse; it was after very little hesitation that I knew. Such a once in a lifetime animal must be called Top Hat. For one thing, the top hat is associated with gentlemen. In 1890, the St. James Gazette writes When we are told, Hes a fellow who wears a top hat and a frock coat, we know sufficiently well what sort of fellow he is. Originally, the top hat was modeled after the tall hats made of beaver in the early 1800’s. During the early part of the twentieth century which, by the way, is known as The Century of the Top Hat, animal fur was replaced by “hatter’s plush” or silk fabric. This made the hat more accessible to the rising middle class and must have been greeted with enthusiasm by the North American Beaver population. The popularity of the top hat, or “high hats” as they were called in the 1920’s fell off when men began to wear bowlers and fedoras for day wear. One of the factors in the decline of the top hat is that they were not suitable for mass production. A top hat must be hand made by a skilled hatter. Sadly, few young people were willing to take up the trade. Those of us who are reluctant to consign the top hat to extinction are in luck. 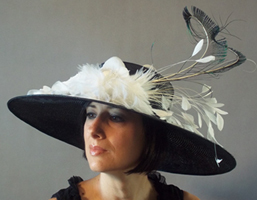 Polly Singer Hats Couture Hats and Veils has added several new top hat designs to the line. For a distinguished, distinctly equestrian look Polly has taken the classic equestrian style top hat and experimented with various trims. Lady Salisbury, named for the first woman to ever hold the position of Master of Foxhounds, has the flattering proportions of the style hat that is still required attire in upper level dressage competition. 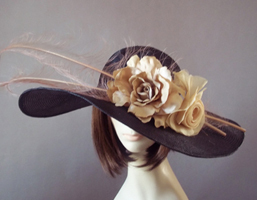 Lady Salisbury, available in black or navy sports a feminine swath of black veiling. 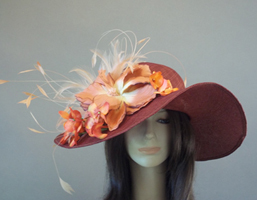 Miss Skittles, inspired by Catherine Walters, a nineteenth century beauty who made a name for herself as a horsewoman and lady cavalier is distinguished by a lush hand band fashioned from pheasant feathers in autumn colors which is a perfect complement with earth-toned fashions. Celia, is the most whimsical of this line, again, well bred equestrian lines ornamented with black satin ribbon, several iridescent feathers secured by tiny seed pearls. Appropriately named, this most unorthodox tophat in the collection honors Celia Fiennes whose diary entitled Through England on a Side Saddle records Celia’s extraordinary horseback journey through 17th Century England.The design Celia is as lively and bold as it’s namesake. All three of the aforementioned top hats are perfect with suits, and pants suits and complement all styles of outerwear from dressiest coats to your beloved knock-about-jacket. For the evening however, Polly has taken the top hat down a more fanciful path. Minaturized and unrestainedly decorative her mini top hats are a spoonfuls of fun! In the spirit of Madmoiselle Magnifique, the new design, Cabaret is a delightfully droll headpiece with a lot going on– a flume of airy crinoline, irridescent peacock feathers and stripped coque in black and fuchsia make this hat a stunner. Nothing more than a simple black dress is needed to create a sensation. During the holiday season one sure fire way to stand out among the ubiquitous black is by wearing winter white. Polly has designed a tiny white top hat for this contrarian’s choice. White Mischief is a crisp little sinamay top hat banked in white veiling and tufts of white feathers. The look is both ethereal and witty. The hat can be customized by touches of color or done in all white as a sophisticated bridal look with today’s sleek strapless gowns. My dear horse Top Hat is living out his retirement in a vast field of Kentucky bluegrass having during his career carried me on breathless chases and my child over even more nerve-wracking 4-H jump courses. He has on occasion submitted with great humor to wearing a Dracula cape or butterfly wings in costume classes. Everything ever asked of him, he’s performed with impeccable manners, courage and great wit– a gentleman to the tips of his ears, ever mindful of living up to the name “Top Hat”.